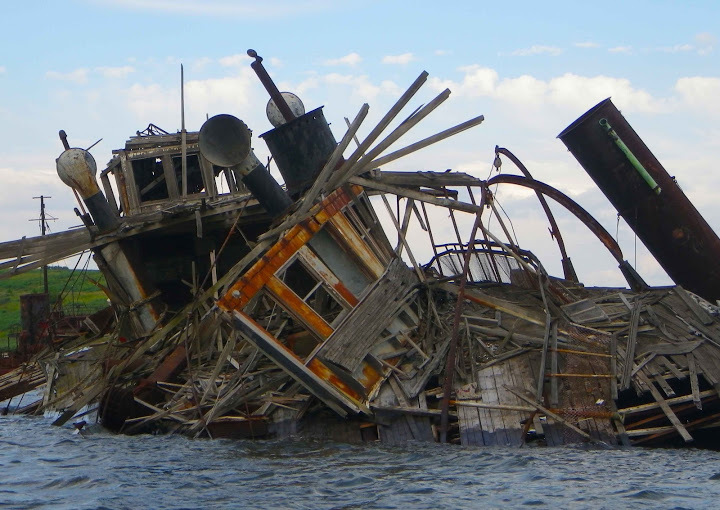 Part of the Graveyard of Ships in the Arthur Kill, New York Harbor. More recent photos of the Graveyard are here. A contribution to this week’s Photo Challenge, Broken. This entry was posted in Kayaking, New York City, Photography and tagged Broken, Graveyard of Ships, Kayaking, New York Harbor, Photography, postaweek, postaweek2015, Weekly Photo Challenge. Bookmark the permalink. Oh, sad! But you made it look so beautiful and artistic. This is amazing. This is wonderful. We have a boat graveyard near me in NW England and it’s a place I never tire of visiting. You know I love seeing this! Memories of good old Staten Island, roaming around and finding one crazy sight after another. One day these boats will be gone altogether, so it’s good that you keep documenting them. There used to be a huge graveyard full of old WWII destroyers and battleships up on the Hudson. Do you know if it is still there? It was a long time ago, so maybe they’ve junked all those ships by now. All long gone now. They were there from 1946 until the last ships were towed away in 1971.
sad and truly broken! so perfect for the challenge! What a powerful photo indeed! Excellent view. I love exploring structures from a kayak.